There's a new set of 3Rs for our kids-respect, responsibility, and resilience-to better prepare them for life in the real world. Once developed, these skills let kids take charge, and let parents step back, to the benefit of all. Casting hover mothers and helicopter parents aside, Vicki Hoefle encourages a different, counter-intuitive-yet much more effective-approach: for parents to sit on their hands, stay on the sidelines, even if duct tape is required, so that the kids step up. 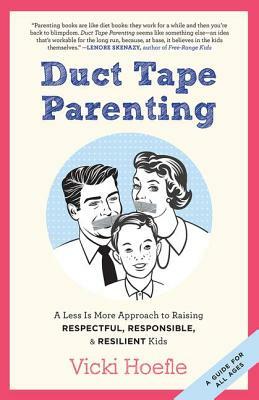 Duct Tape Parenting gives parents a new perspective on what it means to be effective, engaged parents and to enable kids to develop confidence through solving their own problems. This is not a book about the parenting strategy of the day-what the author calls "Post-It Note Parenting"-but rather a relationship-based guide to span all ages and stages of development. Witty, straight-shooting Hoefle addresses frustrated parents everywhere who are ready to raise confident, capable children to go out in the world. Vicki Hoefle is a professional parent educator, author, parent coach, and national speaker with over twenty years of experience teaching parents, educators, and caregivers how to raise respectful, responsible, and resilient children. Hoefle combines her expertise in Adlerian psychology and as an International Coaching Federation certified coach to bring parents sustainable and proactive parenting strategies that provide time-tested tools for harvesting a happy and peaceful family life. "The Straight Talk on Parenting: A No-Nonsense Approach on How to Grow a Grown-Up" (Bibliomotion, 2015) is Hoefle s second book; she is also the author of "Duct Tape Parenting: A Less is More Approach to Raising Respectful, Responsible and Resilient Children" (Bibliomotion, 2012.) Her informative and highly engaging presentation style keeps her in demand as a speaker, facilitator and educator. Hoefle is a mother of six and lives in Middlebury, Vermont. Alex Kajitani was named California Teacher of the Year and a Top-4 Finalist for 2009 National Teacher of the Year."